If you are interested in having visual identification badges in full colour then this is the product for you. Our 75 x 25mm name badges can be printed with a full spectrum of colours including your logo and any text that you require. With a wide range of background colours and font options, we can make your name badges look professional and engaging while keeping in line with your company's branding. All of our name badges come with a choice of three fittings, Pin, Clip or Magnet. All of our name badges are domed with a scratch-proof epoxy resin. Not only is the plastic coating scratch-proof, but it also protects the badge from the sun’s harmful UV rays. This protection helps to keep your logo looking bright and fade-free, preserving your design’s vibrant colours for years of faithful service. If you are looking for simple yet effective badges then our Standard plastic name badges are for you. 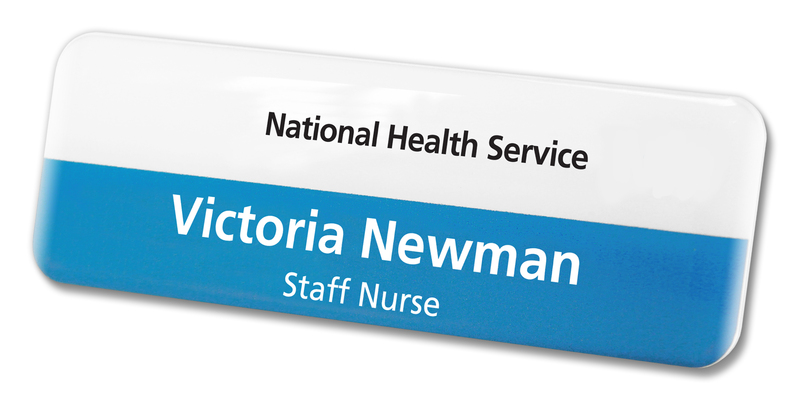 Professional and high quality, but cost effective these are our best selling name badges. In a world where first impressions count, our Premium range of corporate name badges set your business apart. We use the latest technologies to produce metal badges that exude an air of quality and design. Other options are available, for more information call us on 0333 7000 123 or click here to enquire.